There’s a temptation when faced with a film like “Endgame” to give it a pass as harmless family entertainment. It has its heart in the right place and is eager to please. The real-life triumph of the disenfranchised public school students from Brownsville, Texas, who became chess champions is inarguably inspiring. Their story is certainly worthy of being told, but director Carmen Marron has greater ambitions. She also wants to tackle damaged family bonds, teenage death and the tragedy of deportation faced by illegal immigrants. “Endgame” tries to be about many important issues, and ends up doing none of them justice. That’s a shame, considering how the film could’ve been a refreshing dramatic showcase for sitcom star Rico Rodriguez. He’s a young man of ample girth who wears glasses—a prime target for bullying at his age—yet he never utilizes his appearance to acquire cheap laughs. He looks like any other normal kid, struggling to find his place in the world while grappling with the ever-present nuisance of puberty. 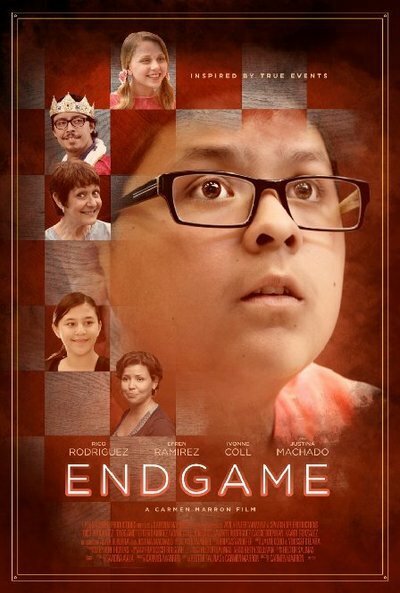 The fact that his words don’t ring true in “Endgame” may have less to do with his seven seasons on “Modern Family” and more to do with the script by Marron and Hector Salinas, which appears to have been stitched together entirely from recycled fragments of Afterschool Specials. This is the sort of film where a teacher gives an inspirational pep talk to a student while standing in front a sign that reads, “INSPIRE.” The fictional narrative contrived here isn’t a fleshed-out story so much as a list of bullet points. None of the emotional payoffs are earned because nothing is adequately developed. We see young Jose (Rodriguez) excelling at chess while under the tutelage of his grandmother (Ivonne Coll) and devoted coach (Efren Ramirez), yet we get no real sense of his technique. There are numerous overhead shots of pieces being shifted and checkmates being declared, but little context as to how the game actually works. A scene where the teacher instructs students to practice on a life-sized chess board is no help, since it’s more concerned with the mugging cuteness of the kids’ dance moves. The deportation subplot comes completely out of left field and is so whiplash-inducing in its haphazard placement that it elicits incredulity rather than empathy. You can practically hear the soap opera clang on the soundtrack as this twist is revealed, only to be swiftly abandoned long before the final act. Marron does a disservice to this monumentally topical issue by treating it like an arbitrary plot point. The same could be said about Karla’s inner demons, which she finally reveals in the film’s only instance of raw feeling. She lashes out at her mother for being distant throughout her childhood, choosing to focus on chess tournaments rather than her maternal duties, and then accuses the blindsided woman of using chess to place a wall between her and Jose. It’s an effective scene, but it establishes a dynamic that is never developed beyond the stage of a first draft. How do the mother and daughter make amends prior to the happy ending? You won’t find out by watching the movie.